Chiropractic care is particularly effective for dealing with headaches, specifically migraine headaches and tension headaches. As a lot of Americans suffer from these ailments, an alternative and medication-free treatment is often recommended so as not to suffer the risks of narcotic treatment. Migraines are a curse for a lot of people. These aren’t regular headaches that can be cured easily by popping a pill or by resting. With migraines, the intense throbbing pain in a specific area of the brain can become unbearable. Since extreme sensitivity to light or noise is usually part of a migraine, a sufferer’s productivity and ability to function goes downhill when an attack occurs. Aside from light and noise sensitivity, migraine headaches can also bring on other symptoms which greatly affect the quality of life of the sufferer. This includes vomiting, sweating, fatigue, and a loss of appetite. The symptoms can be so great that a lot of sufferers cease to be productive not only for hours but for days after the migraine attack. Medications are used by many people that suffer from migraine headaches. When these patients take painkillers, the symptoms are addressed, but the root cause of their discomfort (the migraine) remains unaffected. Prevention in this case, is almost always the best cure for migraines. Sufferers are taught to recognize the early warning signs of a migraine attack, and immediately head it off by taking painkillers, going to a dark and quiet room, drinking liquid with caffeine, or putting a cold towel on the forehead. There are no single triggers for migraine headaches, so it can be difficult to correctly predict when an attack will come. 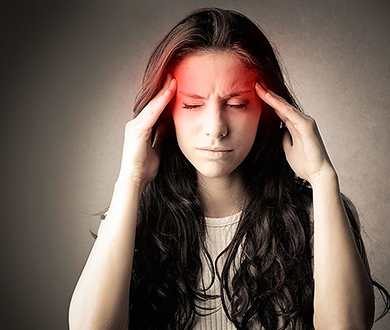 With regular chiropractic care, migraine sufferers report lesser instances of migraine attacks. Because a majority of headaches are connected to biomechanical problems in one’s upper cervical spine, treatment by a chiropractor can correct these problems through spinal manipulation, thereby reducing the likelihood of headache onset. Chiropractors also use therapeutic massage — also called a deep tissue massage — which loosens and relaxes tense muscles. Sufferers experience muscle spasms which lead to or worsen migraine headaches, and massage serves to reduce the pain by relaxing these affected areas. With regular manual adjustments by a chiropractor, proper blood flow is restored in the body and posture is improved, greatly reducing the number of migraine attacks. It is “the worst headache of your life.” This is actually a phrase medical professionals encourage patients to use and could be a symptom of a serious problem.